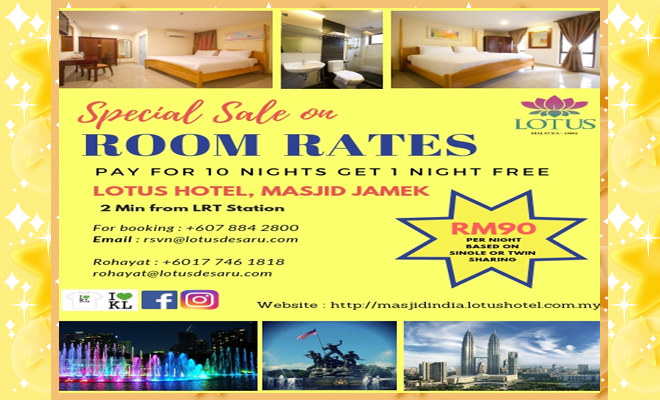 Housed in the heart of the metropolitan city, Kuala Lumpur, Lotus Hotel is situated in a strategic location that makes it accessible to all. With the Masjid Jamek LRT Station and bus station just a stone’s throw away, it caters very much to those using the public transportation. Likewise for people who are driving, a direct route and parking space is made available. The hotel itself is a comfortable haven that strives to create a relaxing and luxurious experience for one. With 93 rooms that are equipped with air conditioning, hot and cold showers, safe box and a flat screen LCD TV, it promises a fulfilling rest for all. In addition, the TV comes with 16 satellite Astro channels. Enjoy your programmes with the complimentary tea/coffee, cookies and mineral water. Feel like exploring the city whilst feeding your palate? Then you have come to the right place, as Masjid India is just a brief walk away from the hotel. Be it a distinctive or diverse taste, your cravings will be satisfied here as this food juncture offers an array of delicacies that ranges from North/South Indian, Western to local cuisines. Need some retail therapy? Then you will get some here with the throngs of stalls that sell various Indian and local costumes. If you love jewelleries, then you will be spoilt for choice with a stretch of jewellery shops that carries the latest designs in gold, platinum and even diamonds. The famous shopping outlets (SOGO, JACKEL MALL, LULU MALL etc), Merdeka Square and China Town are also situated all within walking distance. 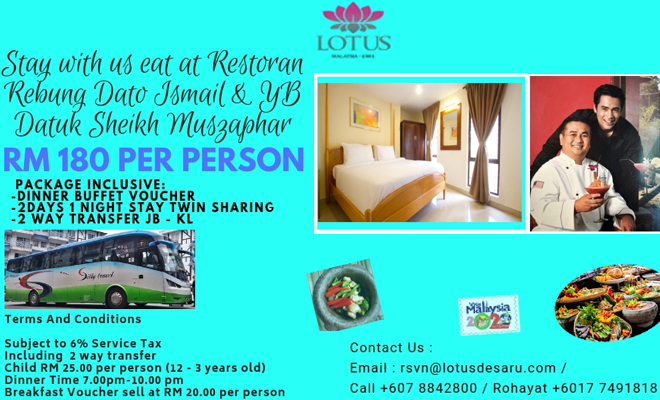 For the adventurous travelers, kindly inquire our receptionist for local tours such as Fire Flies & Eagle Feeding, Sunway Lagoon Water Park, Batu Caves, Genting Highlands, Putrajaya, Elephant Sanctuary and many more exciting attractions. 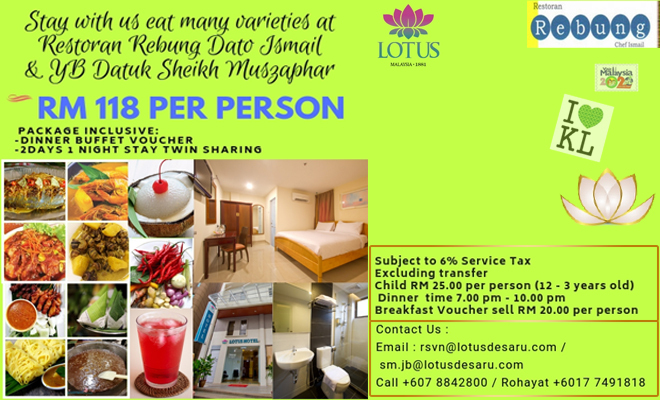 A stay at Lotus Hotel provides the best for all your needs and tastes. It’s indeed an out of the world experience that combines luxury and a taste of the local culture.